Via Castel Morrone is a liberty-style street lined with big trees, not far from Corso Buenos Aires. It is traditionally a residential area inhabited by families and old Milanese ladies but in the last few years groceries and (old) clothing shops have been replaced by bistros, small restaurants and wineries. Casa Capitano is a tiny café that is almost always full of locals at breakfast and merenda (snack) time. 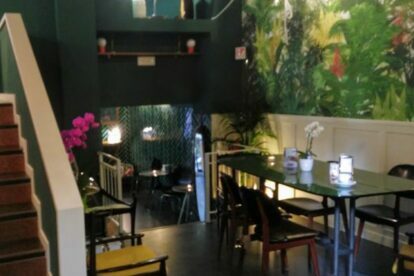 The inside is furnished like a ’30s apartment with dark wooden tables and bottle green walls, which create a cosy atmosphere, but in the summer it is very nice to sit outside, either on the front or on the rear of the café, in a typical Milanese courtyard. The quality is very high, not only of the food (mainly Sicilian chocolates, cakes and savories) but also of the coffee. This is quite easy to guess if you are Italian, as soon as you get inside. The reason is the espresso machine with the big levers at the top. They are used to produce the steam that cleans the machine pipes each time a new coffee is made so that the water, the powder and the remainders of the previous coffee are removed. It takes a bit more time to make a coffee but you can really taste the difference, so just give it a try! Drinking at the bar or sitting for hours doesn’t change the cost, which is quite rare in Milan.